(the Millenials recently took first place), and now they range in age from mid-50s to mid-70s. As they enter retirement, this trail-blazing generation has redefined aging, not only pushing off the designation of “senior citizen,” but also reinventing the whole idea of how they age—and where they will do it. Though Baby Boomers’ grandparents largely stayed put, the Baby Boomers themselves have demanded other choices. This can be attributed in part to the fact that people live much longer than they did in 1900; their plans for post-retirement aging have expanded from a few years to several decades. Retirement is now a stage of life that lasts long enough to require careful and realistic planning. To that end, many of today’s adults of retirement age need to put careful thought into how they will spend this stage of their lives. Planning ahead for these years means defining where and how you want to live, and, at the same time, being realistic about the inevitability of aging and the complications and uncertainties this can engender. Thankfully there are many excellent options, most of which fall into two categories: Retirees can join communities that provide a full or partial continuum of care, known most commonly as Continuing Care Retirement Communities (CCRCs); or they elect to “age in place,” remaining home (though “home” could also be the home of their extended family) and making whatever structural modifications are needed along the way. “I’ll never go into a ‘home.’” This was a near-constant mantra from my elderly grandfather. Almost ten years a widower, he was proud of his independence and he never wanted to leave his tidy little Cape Cod. As he moved into his 90s (his 90s!) however, things began to change. He hired cadres of people to maintain his house and yard, but his vision was failing, and so was his manual dexterity, and it became hard for him to take care of himself. He could no longer drive and no one came to visit. With failing eyesight and hearing, he couldn’t watch TV, talk on the phone, or use his beloved computer. His world began to shrink exponentially, and he became lonely, isolated and perhaps depressed. But at least he hadn’t been put into a “home,” as he called it, envisioning a sad, dim nursing home where elderly people were parked in wheelchairs and forgotten. His fear of such a place was palpable. He had his pride, and even if his quality of life was dwindling, he was determined to hold out … until of course, he couldn’t. Today’s CCRCs couldn’t be farther from the “home” my grandfather feared. 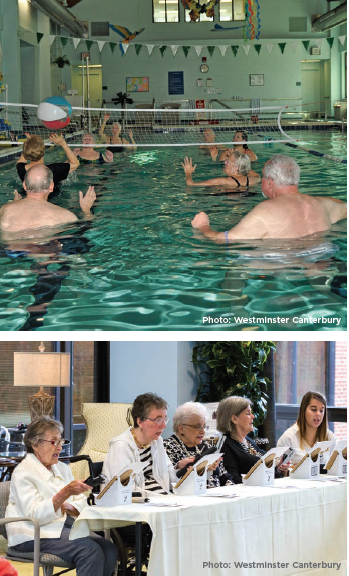 To begin, they often resemble luxury resorts, complete with indoor swimming pools, gyms and fine dining—but they also offer a full continuum of care, from practically none to 24-hour skilled nursing, all on the same campus. 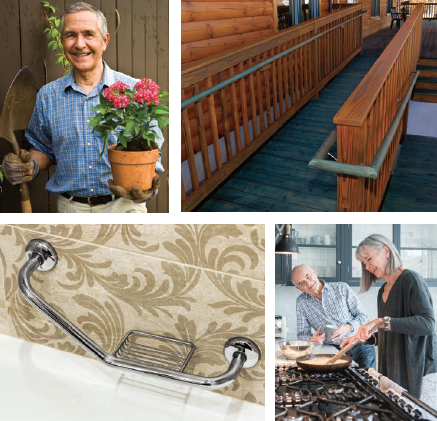 The first stage, the “independent living” step on the continuum, is often just that: Residents live in apartments, condos, or even freestanding houses complete with full kitchens, 1-3 bedrooms, laundry, balconies and even sometimes small gardens and patios. The second stage is “assisted living.” This stage offers step-up care for people who need a little extra help completing daily tasks but who do not require full-time care. The third step in the continuum is “long-term care,” which provides round-the-clock assistance, skilled nursing, and even sometimes memory care for those struggling with Alzheimer’s Disease and dementia-related illnesses. Often these communities also have a separate, short-term rehabilitation unit for people who are recovering from surgery or other illnesses. 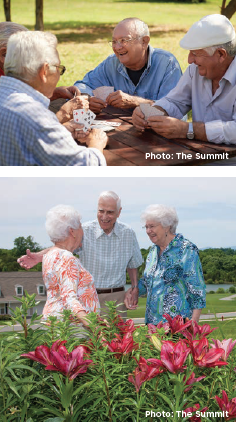 Seniors who choose to join an independent living community are encouraged to do so while they are still young enough to enjoy the many amenities offered at every level of care. Once they have joined, seniors can transition, as needed, through the different levels of care all within the same campus. The advantages of this are obvious: Seniors can stay onsite for the rest of their lives with no disruptions of their social and care networks. They also have peace of mind—and so do their families—knowing that as they age, their needs will be met. 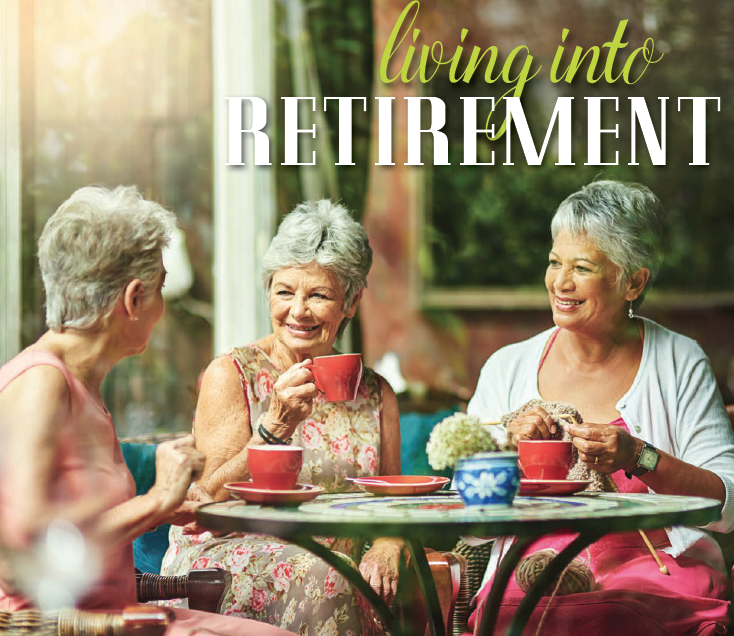 While retirement communities like The Summit or Westminster Canterbury do offer predictability and stability for retirees entering the next stage of life, there are some things to consider: First, planning is key. Financial planning is a must. Whether utilizing health or long term care insurance, Medicare, or personal savings, you will need to find a path that fits your individual financial picture. Thankfully most retirement communities have experts on staff who can help clients chart the best path. The term “Aging in Place” can refer to a diverse category of alternatives for older adults who cannot or do not want to join a retirement community. These are most often seniors who choose to stay in their own home, contracting for the health, transportation and home maintenance they need. It can also refer to intergenerational living or other self-designed living arrangements. Lacking the built-in continuum of care available to residents of CCRCs, retirees considering this option will need to budget and plan for their future years by essentially building their own plan for each stage of the aging process. 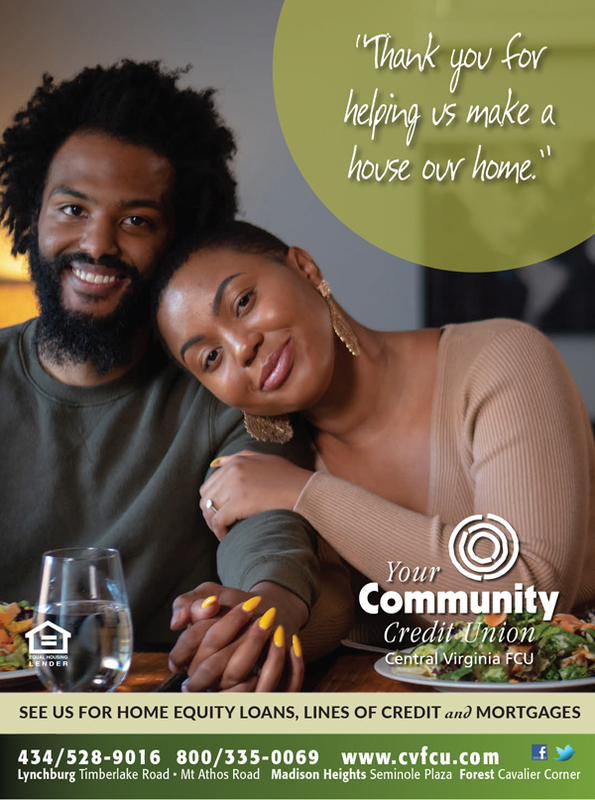 Often this will mean making some big changes, even if you are planning to remain in the same home or move in with family. Though hiring help with tasks that can be challenging for older individuals, such as home maintenance or housekeeping, will certainly help, sometimes the home itself needs to be updated or modified to make everyday living easier. Your first step should be to talk to an expert. The National Association of Homebuilders offers builders who qualify a Certified Aging In Place Specialist (CAPS) designation. Builders with this certification have received special training in the housing concerns for older individuals. Jeremy Smith of F&S Builders of Lynchburg, who serves the Central and Southwestern Virginia areas, proudly maintains a CAPS certification. “I strongly recommend that people who plan to age in place look for a builder with CAPS certification before starting a project with an eye to aging in place,” he says. “You need to be certain that a builder or contractor knows what he is doing with respect to the needs of older people and the requirements and building codes of specialized equipment such as elevators or walk-in tubs.” In business for over 30 years, F&S Builders has completed many renovation projects to help older individuals stay in their homes, from small improvements such as installing grab bars in bathrooms and widening doorways to accommodate wheelchairs, to large, full-scale renovations, such as two-story remodels with elevator installation, a custom roll-in tile shower, even an “endless pool” and outdoor landscaping designed to be accessible to homeowners with limited mobility. 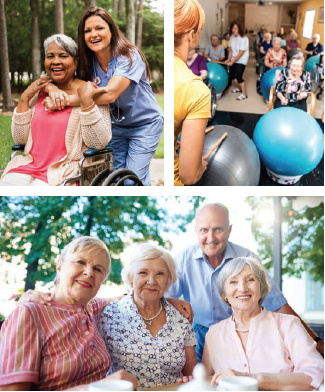 Orchestrating a safe home environment will go a long way to ensure that individuals or couples can continue to live in their own homes, but sometimes even the healthiest and most active seniors have health issues that restrict their ability to care for themselves and may require medical care or rehabilitation. It is far better to have a plan in place for this ahead of time, rather than waiting for a health crisis to occur. There are several options for home health care available today; in fact, many communities have rehabilitation wings with skilled nursing care where even “non-resident” seniors can recover from an injury or illness. Alternately, many of these same organizations have home-health extensions such as Westminster Canterbury’s “Senior Independence,” which offers home- and community-based services designed to help older adults remain in their own homes or in the homes of their families. The idea of spending your “golden years” in a rocker on the front porch is over … but only if you want it to be. 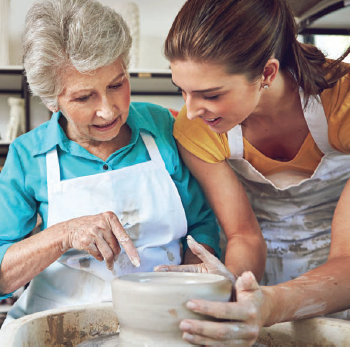 As a retiree, you could be taking college courses, playing golf, teaching children to read, or learning to paint. You could be living with your extended family, or in the same home you’ve always lived in … or in a swanky new cottage or apartment surrounded by new friends. Whether you choose to join a retirement community, or age in place, one thing you won’t be short on is options. 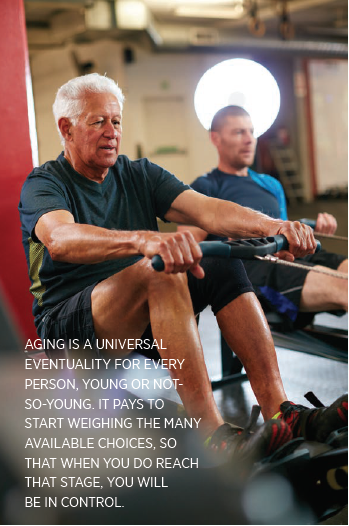 Aging is a universal eventuality for every person, young or not-so-young. It pays to start weighing the many available choices, so that when you do reach that stage, you will be in control. With foresight, practicality and creativity, options for how to spend retirement are both exciting and full of promise.